There is a place along Errol Street, a little north of the central ‘plaza’ of cafes, stores and restaurants. A provocative place, luring you into indulgence. Recently I succumbed to desire and en­tered, and my tongue, stomach and mind have thanked me for it. At Mörk Cacao Artisans they deliver an ex­perience in chocolate sweets and, more promi­nently, in hot chocolate drinks. They serve traditional hot chocolates made from high-quality cacao. The type of hot choc­olate drink you associate quite readily with that particularly comforting feeling of a warm drink on a cool day. 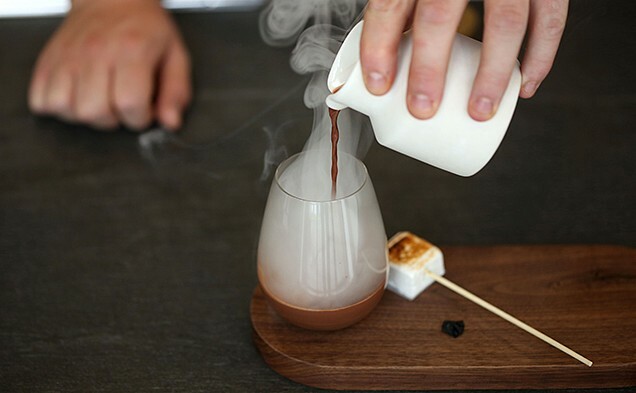 However, although the traditional hot choc­olates offer a certain allure, when enjoying yourself at Mörk, you cannot leave without tempting your senses with one of their signa­ture hot chocolates. Mörk’s adaptations of the traditional hot chocolate are so unusual and interesting, you’ll find yourself in need of time to choose between the vast array of drinks on offer. I finally decided on the Campfire Hot Choc­olate. A few minutes later the waitress returned with a smooth wooden slab with three items set to make you salivate. The first thing your eyes set upon is the upside-down glass filled with swirling smoke. Alongside this visual display is a toasted brown marshmallow on a skewer. Finally your delectable hot chocolate is served in a curvy spouted jug waiting to be poured, sipped, swished, swashed and swallowed. Mörk doesn’t have wi-fi and isn’t a place to go to enjoy a cup of coffee. In fact they don’t even sell coffee; it’s all about the chocolate! Mörk Cacao Artisans is a place to go for a chocolate experience. The décor is modern and inviting, the staff prompt, friendly and helpful. When you first sit down you are provided with a refreshing sparkling water to start your experience. When your drink arrives, you are given the joy of pouring the chocolate from the spouted jug yourself. The chocolate is delicious and the sweets and desserts are equally amazing. Mörk is a cafe for chocolate lovers.